"That day, we faced twelve. The Cruor Praetoria, the twelve strongest; the twelve daemons whose lives and deeds most pleased their wretched Blood God over fourty thousand years of warfare." 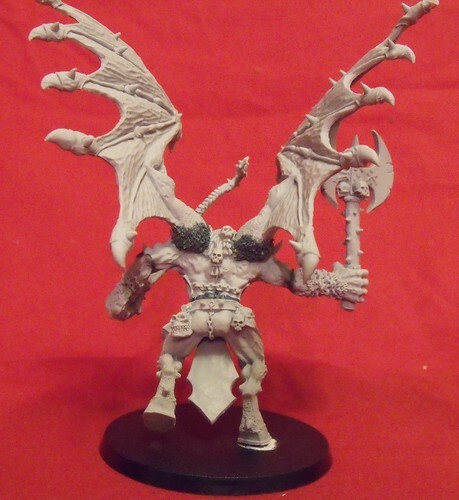 For my first Bloodthirster I decided to pretty much assemble the classic Bloodthrister kit it as it comes, to provide inspiration / scale guidance for the rest. Of course, I had to make some modifications. Otherwise it'd be boring. I started by making the legs more dynamic - so easy with Finecast, I just dunked them in boiling water for a minute, bent them to their new pose, and then put them under the cold tap. I wanted to make him look like he's running, add a sense of movement, so I also added the whip the wrong way round. I think that makes it seems more that he's sprinting forwards, just in the moment of cracking the whip down. My previous models for my Adeptus Mechanicus & Dark Mechanicus (viewable here http://admech.blogspot.com) are quite static, so I'm keen to use this project to experiment with more dynamic models and poses. 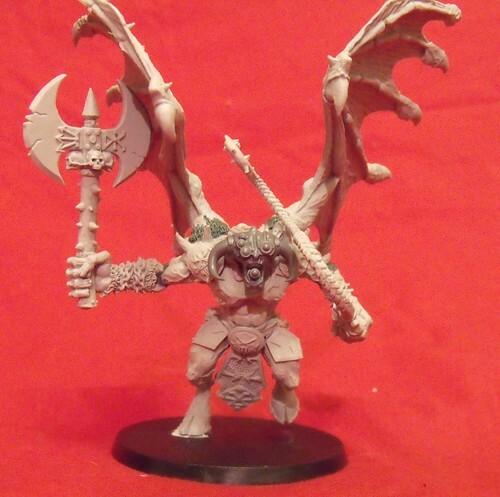 I want all of my Bloodthirsters to have at least *something* that makes them more 40k than WFB, some technology, so I changed the head. 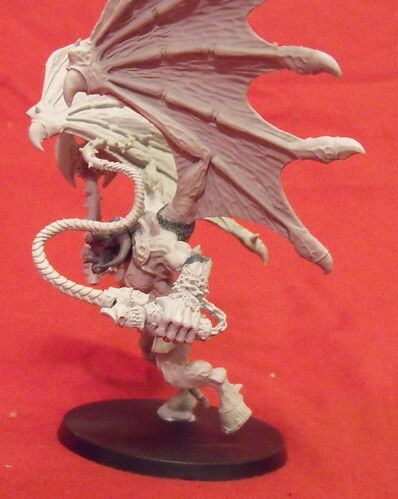 I also want them to work alongside my planned Forge of Souls / Dark Mechanicus daemon army, so a technological edge is essential. I quite like the idea of them all having helmets rather than uncovered heads, this may continue for the entire army of 13. 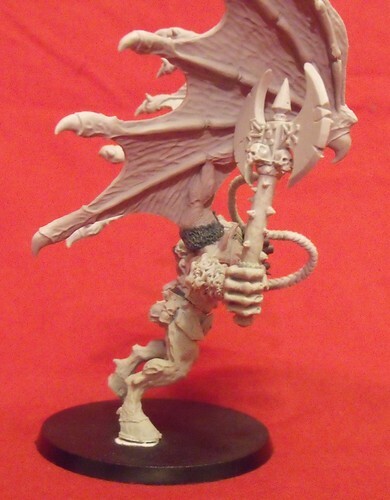 The head is from the vehicle upgrade sprue, an excellent little sprue that I use lots.